Earth Dwellings Australia is a Rammed Earth Contractor with 9 years experience in Rammed earth construction. We are located on the East Coast of Australia and provide services for most of NSW. Please contact us for more information. Below you will find some more information about the benefits of rammed earth. Rammed Earth has amazing energy efficient properties, but it has to be used the right way. Rammed earth doesn’t act like insulation material like roofing bats (with lots of tiny air pockets) but it has thermal mass. It is probably best related to living in a dry cave with windows. A well designed rammed earth house will have eaves that enable the sun to hit the wall in winter. The walls will absorb all the suns heat and slowly release that energy over the next 12 hours. This is called thermal lag, which rammed earth has the best rating of any material (far better than concrete or stone), and evens out the fluctuations in day and night temperatures. In summer the walls are shade from the sun, resulting in a comfortable and constant living temperature all year around. Thermal mass is great for the performance and ongoing running costs of a house. The need for air-conditioners and heating is greatly reduced. The air quality is also much better than any other material as it regulates the humidity and exchanges the air constantly. It also has no toxins or VOC’s. The design is very important for solar gain and also for reducing construction time and costs. If you would like any advice, we would be happy to help. Please go to our contact page. Rammed earth also has very low embodied energy. The material is usually source from local sources and the whole construction process has a small carbon footprint and is one of the easiest building product to recycle at the end of the buildings life. 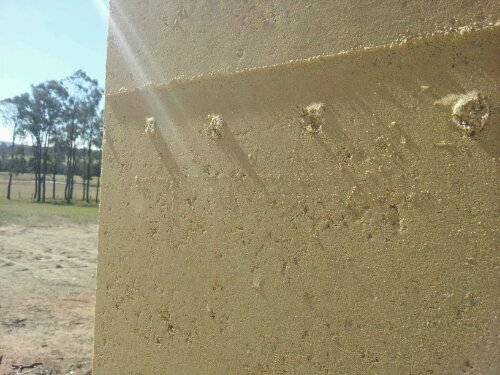 Tests by CSIRO have given rammed earth a four hour fire resistance rating, which is very favorable. This means a rammed earth wall would withstand ember and flame attacks during a firestorm and protect you from radiant heat. Walls are only one aspect of fire safes houses, but it ideally suited to fire prone areas. Recent fires in California and Black Saturday in Victoria showed rammed earth walls performing very well. It also helps protect you from internal house fire. 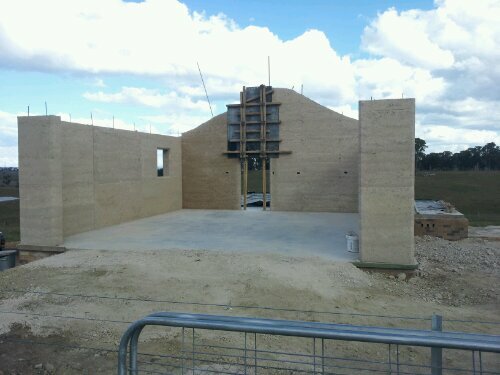 Rammed Earth walls range from 200mm to 600mm thick. This provides great acoustic insulation. This is a great design attribute for dividing walls in townhouses, walls facing neighbors or just walls separating parents from children. It also makes great fencing and sound proofing from street noise. Rammed earth can be extremely quick. When the walls are ‘stripped’ (formwork removed) you have the finished product. It reduces the need for other trades like plasterers, painters etc. Please contact us if you are after structural advice. Rammed Earth is extremely strong building product. It is a load b earing product and can also take the load of suspended slabs. There have been six story building made from rammed earth. Rammed earth is termite free. Termites cannot penetrate the rammed earth mass. This prolongs the durability of the house. Many people choose steel frame houses because of their termite resistance, but rammed earth offers a more attractive option.